I’m still getting used to the new digs for work, and as a result have been exploring as much as I can within the limited time constraints of my lunch break. 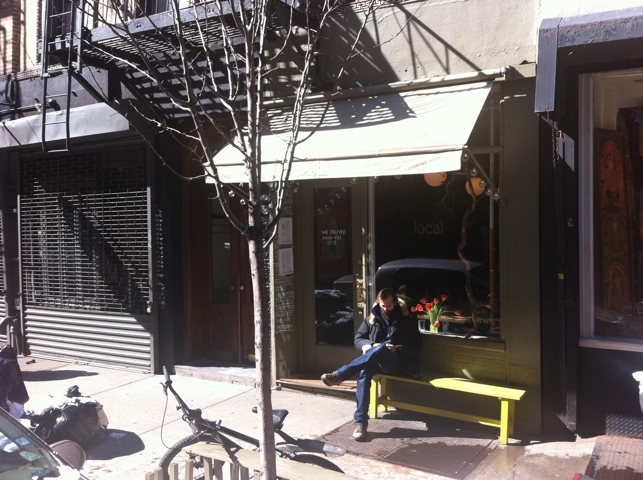 Today’s foray took me past this humble storefront in Greenwich Village with the innocuous name “Local.” However, having been introduced to the slow food movement during a trip to Italy, my hunch was that it meant local products are used in their preparations. It was a good hunch. The interior is very small. This small counter runs pretty much the width of the narrow shop. On the left, you can see the bright green board, which contains their menu. At first, I was dismayed. The prices (as is wont in the Village) seemed high. My eye was drawn by two contenders, a steak sandwich ($10), or a meatball hero ($9). For what I took to be a bit of a poncy shop, I was delighted to see these two hearty dishes. 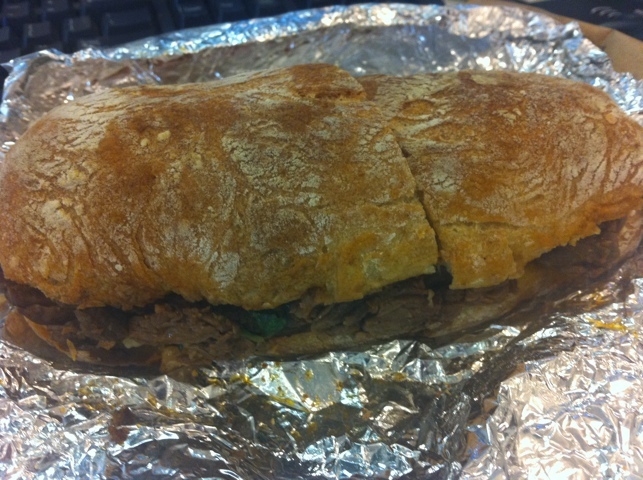 I asked the woman at the counter what’s popular, she said the steak, so I tried it – I am a fan of steak sandwiches. I should add their menu includes things like turkey, chicken salad, some vegetarian options and so forth. I don’t think they are a vegan place, however, but don’t quote me. The place really is tiny. 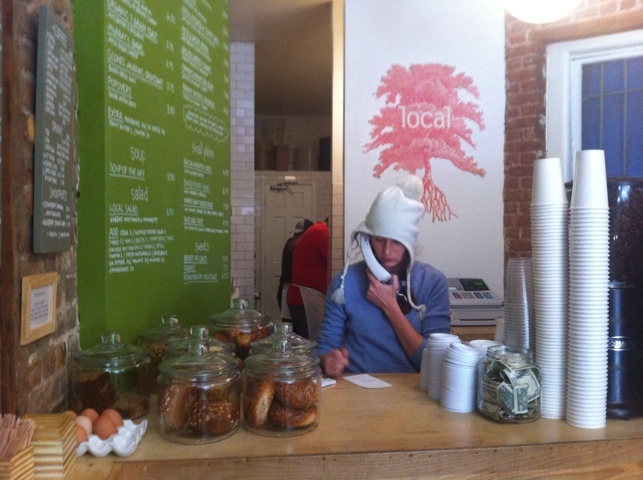 This is the view from the counter. 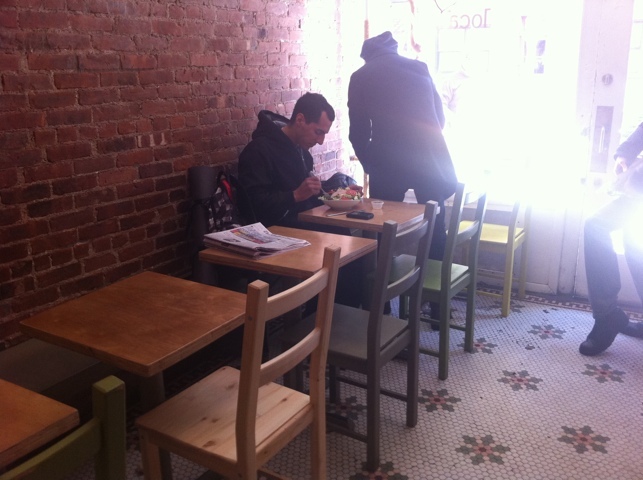 There are (as you can see) five small tables and a bench outside. I’m thinking most people get their food to go. While waiting, I took a closer look at their menu. As guessed, they use organic, locally-produced products whenever possible (or so they say). My steak sandwich was ready in short order. 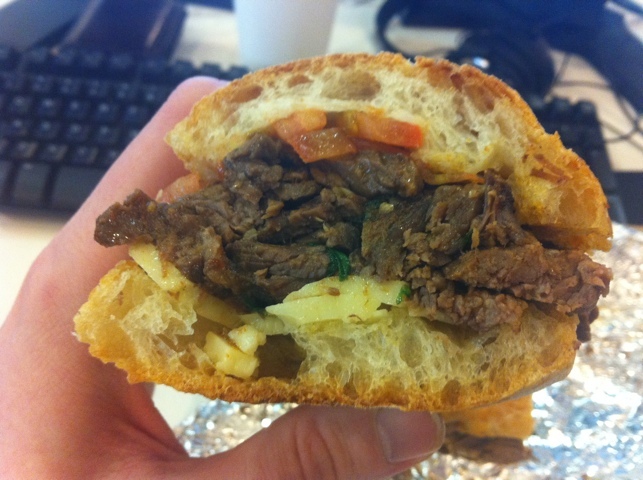 The steak sandwich. Looks promising. While the sandwich isn’t particularly huge, it’s also not very small. I was pleased when I got a look at the ciabatta bread it was served on. Looked fresh and smelled delicious. As it turned out, it was every bit as good (bread-wise) as it looked. 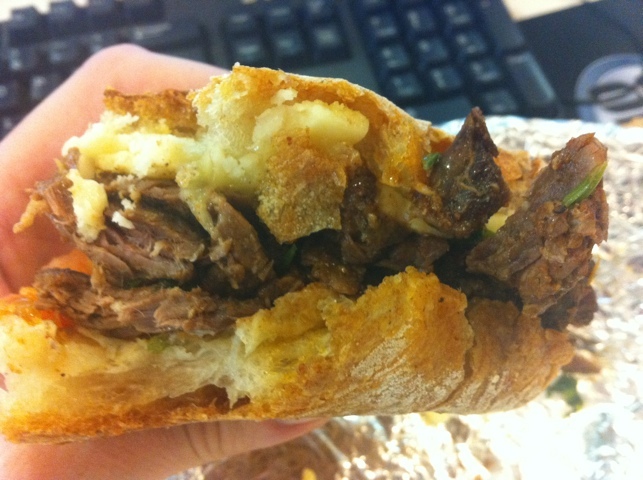 The ciabatta was crunchy and crusty (in a good way). This is the bread that Faicco’s should be using on their otherwise excellent Italian hero. Granted, it would be a bit smaller, but… . It's packed with meaty goodness. The meat is grilled prime top flank steak. Also between the bread you’ll find a lime & cilantro zest, tomato and asiago cheese. I found the asiago to have a flavor (in concert with the rest of the sandwich) that strongly evoked Parmesan. I happen to love parmesan cheese, so to me this was a most welcome thing. Look at that bread! Beautiful. But on to the steak itself. It was neither too chewy, nor too fat, nor too tough, nor too tender. It had a little fight to it but mostly surrendered when chewed. I am glad it didn’t put up the kind of fight you can get from the steak sandwich from Frites ‘N Meats, where you may pull out entire pieces of the steak as you eat. The pieces of steak here, though, are smaller, and numerous. Their preparation calls for a strong pepper note. I found it walking right up to the line of too much, but not quite crossing it. To me, though, it chiefly hides the flavor of the meat. It was enough to make me qualify the sandwich as being hot & spicy – though not too much so. Look, all in all it was delicious. I’ll definitely go back to Local to try their meatball sandwich. Between this, Murray’s, Faicco’s, Five Guys and the variety of trucks that pass near the office, it looks as though lunches should be quite good at the new digs.